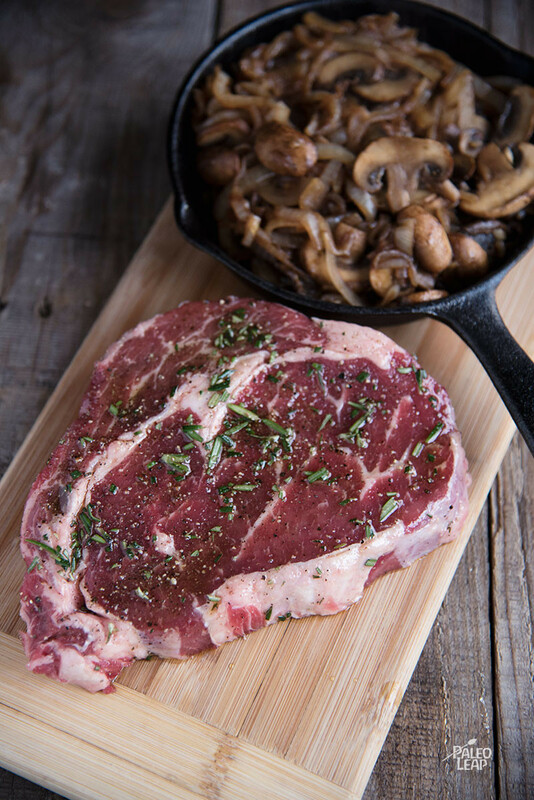 Here’s a luxury dinner to make for a special occasion: a thick ribeye steak topped with mushrooms and onions caramelized and drizzled with balsamic vinegar. It’s definitely a very meat-heavy recipe, but there’s nothing wrong with that some of the time, and you can always add more vegetables on the side to get a little extra plant matter into the meal. If you’re cooking to impress someone, this would definitely be a strong choice of recipe, not just because it’s steak, but also because it’s pretty quick and you won’t have to leave your guest(s) hanging while you endlessly fuss over the stove. Try it with a salad or go for a slightly more assertive vegetable: what about a bright plate of zucchini gremolata to add color, celeriac mash as an interesting twist on mashed potatoes, or garlicky green beans? SERVES: 2 PREP: 15 min. COOK: 15 min. In a bowl, combine the olive oil and rosemary. Season both steaks with sea salt and freshly ground black pepper. Brush the steaks with the rosemary-olive oil mixture until well coated and let sit for 30 minutes. While the steaks are sitting, melt some cooking fat in a skillet over medium-high heat. Add the onions and cook, stirring frequently, until browned and soft. Add the mushrooms and cook for another 5 minutes, stirring constantly. Drizzle the balsamic vinegar into the pan. Stir around to scrape the bits up from the bottom of the pan. Remove from direct heat but keep warm. Grill the steak for 4 to 5 minutes on each side and let rest for 5 to 8 minutes. 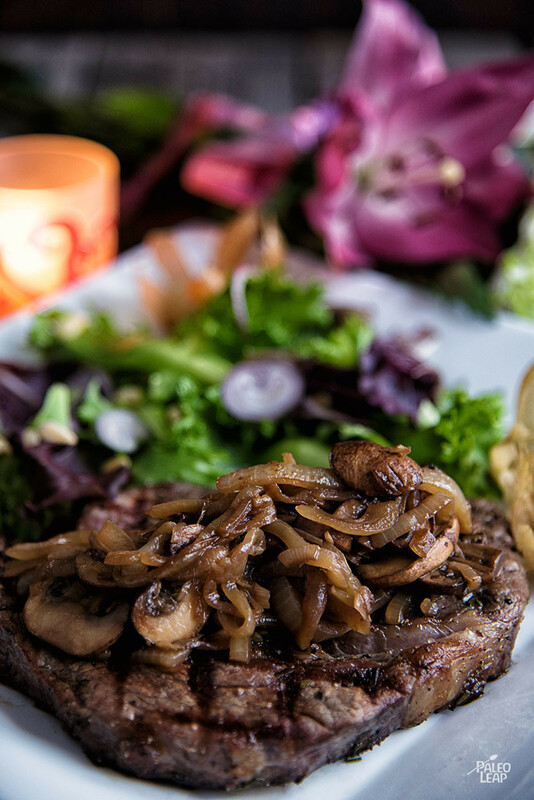 Serve the steaks, topped with the caramelized onions and mushrooms.